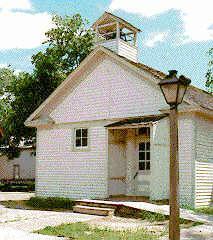 Old Cowtown Museum is an educational instiution dedicated to preserving and presenting the history of Wichita and Sedgwick County, Kansas from 1865 - 1880. 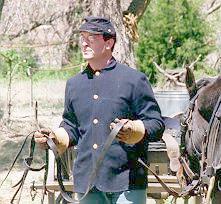 Old Cowtown Museum is accredited open air living history site with over 40 restored buildings on 17.3 acres. Located in the heart of Wichita, Kansas and part of the Museums on the River district, Old Cowtown Museum covers three distinct time periods through its exhibits. The Old Town Area presents the settlement era of early Wichita and includes the Munger House, a story and a half log structure that is listed on the National Historic Register of Historic Places. 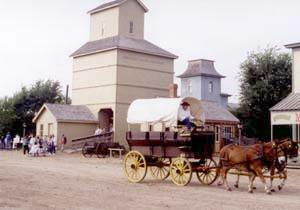 The townscape, which contains the bulk of the buildings in the museum represents Wichita around 1872. It includes working craft sites such as a Blacksmith Shop, Carpentry Shop, and The Wichita City Eagle and print shop. It also includes Fritz Snitzler's Saloon, a reconstructed drug store, and one of the few restored wooden grain elevators. The town site also includes a livery stable with two Longhorn cattle, as well as a Drovers camp. The most recent addition that anchors the 1880 time period is the 1880 DeVore Farm. This working farm demonstrates an established farm in the county and has Berkshire Hogs, Light Brahma Chickens, Red Durham Short-horned Milking cows and Tim and Barney, the black Percheron horses that are used to perform the farming operations. The grounds are staffed daily by up to twelve time-period appropriately costumed interpreters who demonstrate daily life in the late 19th Century. Come journey into that foreign land that is the past! Pump the well, ring the dinner bell and experience the sights and sounds of a growing city. Walk the wooden board walks, try a sarsparilla in the saloon and learn about the days and the ways of the cowboys from our cowboy interpreter. Journey to the DeVore farm to see how "modern" farmers worked the land as they provided food and income for the growing city and county. Come experience the story of Wichita and Sedgwick county from settlement, through the days of cowboys and cattle drives to the refined city that would soon become the largest city in Kansas. The museum holds over 10,000 objects that pertain to the life and history of Wichita and Sedgwick County, Kansas. The primary purpose of the collection is to furnish the historic buildings and demonstrate daily life. The majority of the collection is on display with a small collection of archival holdings that are used in research by the staff and visiting scholars. 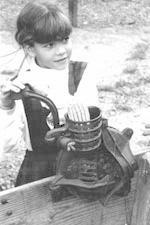 Learn about daily life of children in the 1870s as you watch costumed Scouts portray the 1870s by attending the one-room school, shopping at the general store, making ice cream, cooking with a wood burning stove, playing games, doing needlework, pumping water, and doing other daily chores. Part of you will long to have lived back then,the other part will be glad you don't - some of those chores look awfully tough! April 1 through October 31. Tuesday and Wednesday seniors are admitted two for the price of one. Follow US 54 (Kellogg Street) west to Seneca Street exit. Turn north (Right) and follow Seneca Street north to the intersection of Seneca Street, Central Avenue and Stackman Drive. Turn West (Left) on Stackman Drive, then immediately left onto Sim Park Drive and continue on for 1/4 mile to the entrance of Old Cowtown Museum, located between Wichita Art Museum and Botanica, the Wichita Gardens. Exit at Second Street heading west and proceed though downtown until Second Street joins Central, then continue to the Intersection of Stackman Drive. Turn west (right) onto Stackman Drive, then immediately left onto Sim Park Drive and continue on for 1/4 mile to the entrance of Old Cowtown Museum, located between Wichita Art Museum and Botanica, the Wichita Gardens.